When the Dutch arrived in Cape Town in 1652 they had no idea of what riches the land they were entering held. With the arrival of Simon van der Stel things started to change as he explored the countryside and started opening it up to farmers. At that time the Namas an African tribe lived in what is now called Namaqualand . They had somehow discovered metals and used them to produce tools, weapons and ornaments which they bartered with neighbouring tribes for goods. It was in 1681 that a group of these Nama miners visited the settlement at the Cape and came into contact with Simon van der Stel. When he saw their excellent samples of copper goods he immediately took some of them and despatched them to the directors of the Dutch East India Company in Holland who instructed him to find the source of the copper. Van der Stel sent out many expeditions to the north and eventually in 1685 he undertook an expedition himself and discovered the Copper Mountains of Namaqualand. Mining of the copper began but soon faded out as there was no suitable harbour to export the copper from. Attempts had been made to send the copper by wagon to the mouth of the Orange River but this proved to be an impossible task. The copper mines of Namaqualand lay idle for another 150 years until in 1846 Thomas Grace, a ship’s captain discovered a small natural harbour on the west coast about a 100 kilometres from the town of Garies. Grace established a trading station there and as there was a big rock in the bay which resembled a dog he called it Hondeklipbaai. (Dog stone bay) Four years later the copper mines once again went into production and on the 31st August 1852 the first eleven tons of copper ore was shipped directly to Wales aboard the ship Bosphorus from Hondeklip Bay. 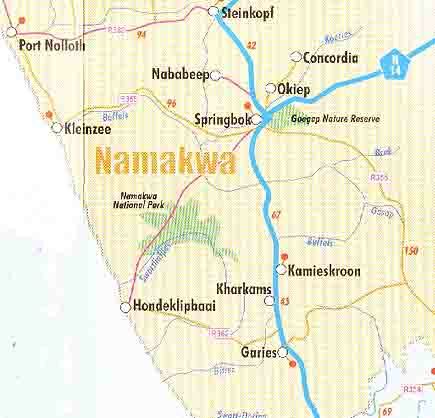 The opening up of Hondeklipbaai as a harbour also increased trade between the Cape and Namaqualand. The little village of Hondeklipbaai soon grew and as the Magistrate of Springbok was unable to exercise proper control over the area it was decided to establish a Magisterial district in the village. This happened on the 26th November 1862 and Arthur Richard Orpen was appointed as the resident magistrate. In the meantime the copper mines at Okiep had come into full production and ore was being shipped to Hondeklipbaai by means of ox wagons across the mountains and deep, sandy plains on roads that were almost non-existent. It was obvious to all concerned that this could not go on so the authorities decided to build a road from the mines to Hondeklipbaai. Prisoners were used in the construction of this road. Unfortunately work on this road was discontinued in 1871 when it was decided to develop the port at Port Nolloth instead of the one at Hondeklipbaai. The town at Hondeklipbaai soon emptied of people who moved to Port Nolloth to continue in the copper trade. Today after the passing of more than a hundred years Hondeklipbaai is still on the map. Over the years a crayfish factory was established which was later mothballed, diamond mining on its beaches came and went and left the town with series of large excavations and overburden dumps which still have to be made safe by the mining companies. Today Hondeklipbaai is setting up a Nature Reserve which will hopefully attract tourists to its shores. In the meantime however the copper mining companies still had problems shipping their ore. They decided to build a narrow guage railway line (two feet wide) from Okiep to the port at Port Nolloth which was opened on the 1st of January 1876. This line operated for 68 years until 1942 when road transport took over. The railway line however has an interesting history in that for the first 23 years of its life mules were used to pull the coaches to and fro along its 146 kilometre course. As the line was downhill for most of the way the trip to the coast meant little work for the mules as gravity was used to move the trains along. The mules were required to work harder on the return trip as they had to pull the empty coaches back up to the mines. Teams of mules were placed every couple of kilometres along the line and the incoming team was replaced by a new team when the train arrived at the mule station. For the last 43 years of its life this narrow guage railway line used steam to move its trains and today the last steam engine "Clara" can be viewed in Nababeep where it is on display.In 1937 the two companies that had mined copper in the area eventually merged forming the Okiep Copper company which is still in operation today. Copper has become a major economic factor in Namaqualand over the years. Two million tons of ore are produced annually by the mines and through a smelting process is turned into copper bars. The bars are then transported to Cape Town by rail before being exported to markets all over the world. The history of copper mining has not been forgotten and many relics of the olden days have been preserved. The original mine shafts sunk by van der Stel are still in existence and are now National Monuments. To see them and some of the relics of the past visitors have to visit some of the mining towns of Namaqualand. I'm sure the Namaqualanders will welcome you with open arms.